Before going to Monte Carlo to break the bank, Charles Deville Wells had committed a large-scale swindle in Britain over a period of several years. In this way he had accumulated a sizeable amount of money, much of which had already slipped through his fingers. Reading about his exploits today we might wonder why he had never been prosecuted: the answer lies in official attitudes towards fraud as a crime, and in the laissez-faire business climate of the time, which favoured minimal government intervention in everyday affairs. Doubtless, when the “rogues and knaves” in question learned of this policy it simply encouraged them to continue their criminal activities. A magazine called Truth expressed the view a few days later that ‘Mr Matthews went out of his way to say that the law will not punish where there has been fraud on the part of these persons. In doing so he not only gave carte blanche to promoters and their decoys to swindle, but he struck a blow at the monetary enterprise of the country’. It is unlikely that Charles Deville Wells ever read this reply. By the time this issue of the magazine had appeared in print (30 July 1891) he was already in Monte Carlo, making a name for himself at the gaming tables. 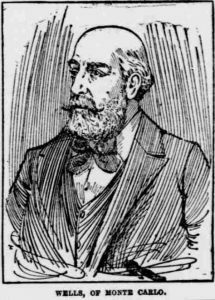 Before breaking the bank at Monte Carlo, Charles Deville Wells earned fame as an inventor – though notoriety might perhaps be a better word. 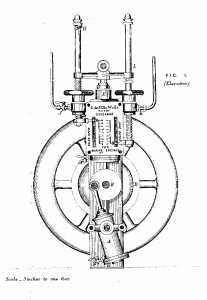 Charles Deville Wells patented this speed regulator for steam engines in 1868 when he was 27 years old. On this day in 1891 the current edition of The Engineer – a weekly magazine – presents a snapshot of a Victorian world still deeply entrenched in the era of horse-drawn power, yet poised to move forward into an age in which machines would replace animals, and in which electricity would take over from gas for lighting and heating purposes. I chose the following assortment of patents from this issue of the periodical more or less at random. Wheels for Velocipedes; Photographic Reliefs in Rubber; Combination Surprise Spring Cannon and Shooting Gallery Toys; Producing Coffin Lace; Magic Goal Kicker; Pictures Projected Upon a Screen; Typewriting Machines; Turning Over the Leaves of Music; Utilising the Power of Streams; Hay Making Machines; Shot Firing Safety Lamp; Mineral Water Opener; Walking Stick Billiard Cue; Convertible Phaeton Front Seat; Retaining Device for Cuffs; Machine Guns; Fire Escapes; Gas Lighting; Ventilating Mackintoshes; Sockets for Electric Lamps; Calks for Horseshoes; Detaching Horses from Carriages; Curling Iron Holder for Gas Jet. Obtaining Photographic Birds-Eye Views; a Multiple-Wick Candle; Sunshades; a Life-Saving Torpedo; and Detecting Counterfeit Coins. Regulating the Speed of Steam Engines; Steam Boilers; Steam Generators. The Casino at Monte Carlo. A view of the southern aspect. 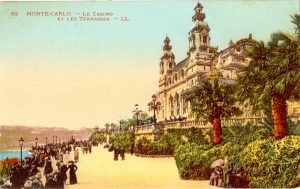 In November, 1889, with £500 given by a friend, [Westergaard] went to Monte Carlo, and, while there he lost that money at the tables, in addition to £300 borrowed from the petitioning creditor, and which he had since been unable to repay … He attributes his failure to losses by gambling, to household and personal expenditure, and to other causes. A week later Charles Deville Wells made his own journey to Monte Carlo and his successes there pushed stories like these on to the back pages. A man named Samuel Dixon, of Toronto, walked across the Niagara gorge over the Whirlpool Rapids to-day on a wire cable three-fourths of an inch in diameter. This is the first time that such a journey has been made from the Canadian shore.